BANGOR, MAINE -- 5/18/2016 -- The harm reduction coordinator for the Down East AIDS Network and Health Equity Alliance in Bangor is offering free Narcan nasal spray to heroin and opiate users and the people who care about them. AUGUSTA, Maine — Gov. Paul LePage wants to force communities to charge people who repeatedly overdose and are given an opioid antidote — and penalize cities, towns and counties that don’t pursue the money. LePage submitted a governor’s bill, LD 1558, on Tuesday that requires municipalities and counties to recover the cost of naloxone hydrochloride from repeat users, and it comes with a $1,000 fine per incident for communities that don’t. Bangor area doctors and advocates said the bill would make it harder to stop the state’s drug epidemic — which last year killed more than one person a day. “If a person suffers more than one cardiac arrest will they have to pay for the second use of a defibrillator?” Nesin asked. Spokespeople for LePage and the DHHS did not respond to requests for comment about why the bill was introduced, or how it would affect communities or counties that get naloxone, commonly sold as Narcan nasal spray, through grant funding or donations. It is also unclear whether the state can force municipalities and counties to charge for services they provide locally to residents. “I am also not aware of other laws of this nature that levy a fine on municipalities for not collecting our own municipal monies,” said Bangor City Manager Cathy Conlow. Currently, no one tracks the number of people who have been given naloxone more than once, according to Maine Attorney General’s Office spokesman Tim Feeley. The AG’s office started providing intranasal Narcan sprays to police agencies across the state last year. The governor’s bill would require municipal or county officials who dispense the medicine to “make all reasonable efforts to identify whether that individual has previously been administered an opioid antagonist” and to “make all reasonable efforts to recover the cost of the dose administered if it is not the first opioid antagonist administered to the individual.” The Department of Health and Human Services would enforce the $1,000 daily fines for violators, according to the proposed bill. Drug overdoses killed 376 Mainers in 2016, up from just 60 in 2000. The overwhelming majority of these deaths — 84 percent — were caused by an opioid, or in combination with an opioid. A 2015 law, originally vetoed by LePage, put naloxone into the hands of police and firefighters, as well as community-based drug overdose prevention programs that partnered with a prescriber. The Legislature passed a law in April 2016, which also was vetoed by LePage, that directed the state’s Attorney General’s Office to buy the opioid overdose antidote in bulk so it would be affordable for first responders. Settlement funds were used to make the first bulk purchase, according to Feeley. Narcan spray maker Adapt Pharma of Dublin, Ireland, also offers a reduced rate for law enforcement and other public groups. 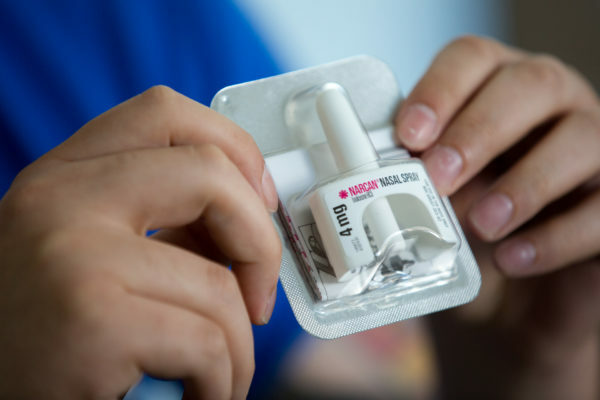 Each unit contains two 4 mg naloxone nasal sprays and cost $75, or $37.50 per dose. “It does more harm than good and it disincentivizes communities from being involved,” said Hicks, who also sits on a state task force to address opiate addiction. Health Equity Alliance gave out 270 Narcan spray kits for free last year and earlier this year to opiate users and their family and friends, and 75 overdose reversals have been reported, Hicks said. He said he planned to testify in Augusta against the governor’s bill and LD108, which would allow law enforcement to issue a bill for dispensing naloxone.